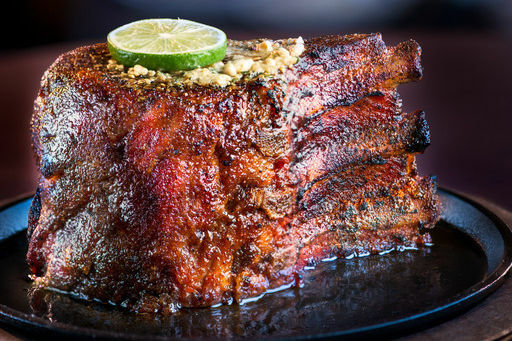 It's not a traditional izakaya, and the Midtown restaurant is better for it. 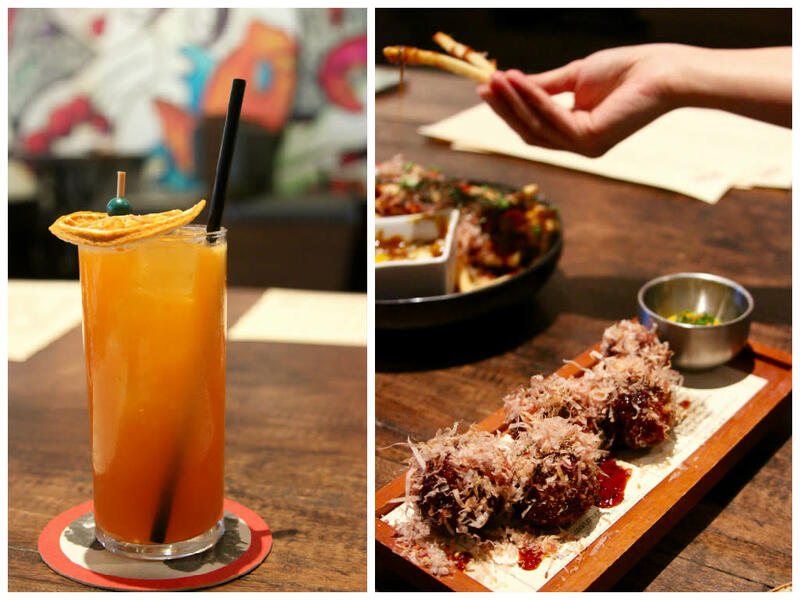 Left: Hotei Highball with Cappelletti, dry vermouth and mandarin orange soda; right; antelope meatballs and izakaya fries. "It's next door to Fluff Bake Bar," I replied. She texted back immediately: "OH GOD DESSERT LET'S GET DESSERT." And as stimulating of an idea as that one-two punch may be, you—like us—may have trouble finding room for dessert after a long, leisurely dinner at Izakaya. 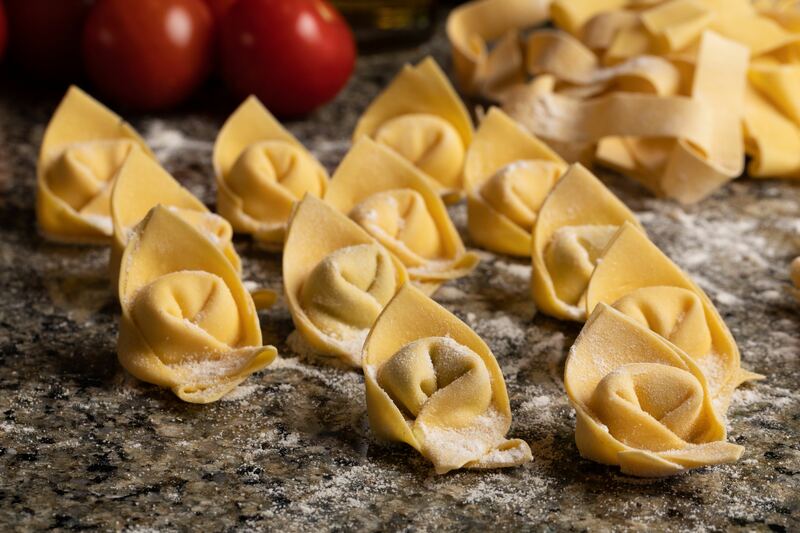 Tucked into a five-top with a group of friends who normally have no problem strongly expressing their opinions and preferences, no one could decide what to order; everything looked too good. Naturally, we ended up choosing nearly everything. 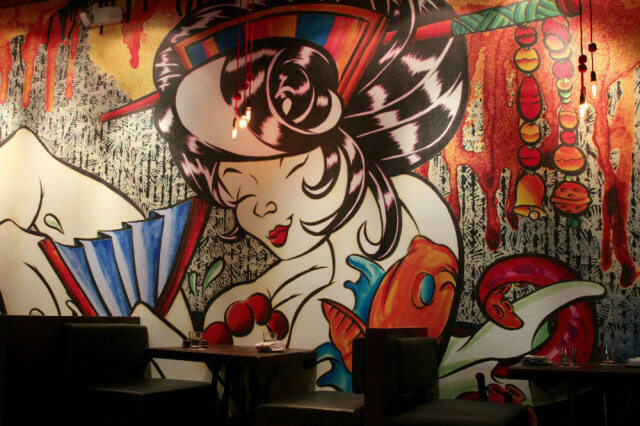 Colorful murals dominate the dual dining rooms at Izakaya. Though I'm normally a fan of the smaller, more curated menu, Izakaya is one of those rare restaurants with a long-ish menu (this one takes up nearly two sheets of legal-sized paper) where each dish gives you pause, calculating how you could either fit it into this meal or how many days it will be until you can make it back for another run-through. 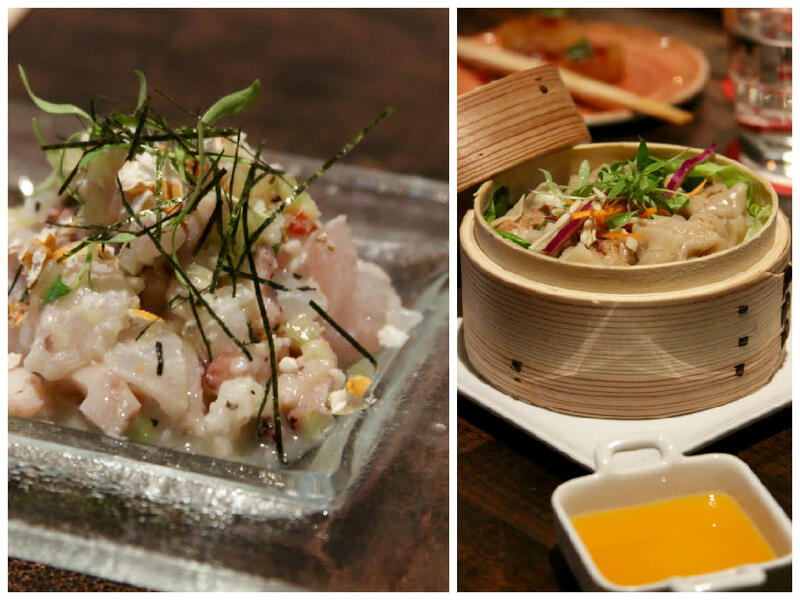 Left: Peruvian ceviche with snapper and octopus; right: duck and shrimp shumai with orange-ginger-habanero sauce. 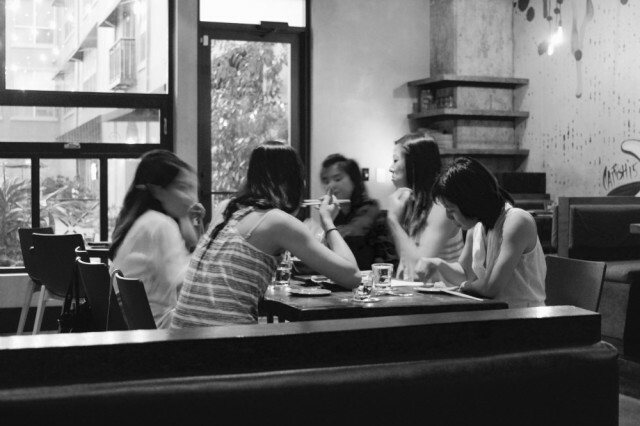 It should be apparent by now that Izakaya is, despite its name, not a traditional izakaya. Elements of the fast-casual grills common in Japan remain, however: groups are encouraged to share small plates of food, tapas-style; Japanese whisky is served with Topo Chico (a Texan take on the standard club soda) in highball form, while Japanese beers are available in bottles (draft is forthcoming); drinking, as evidenced by the seductive cocktail menu, is encouraged. Grilled chicken skin, its decadent flavor neatly cut with a little lemon. But for every vestige that remains, there are new twists. 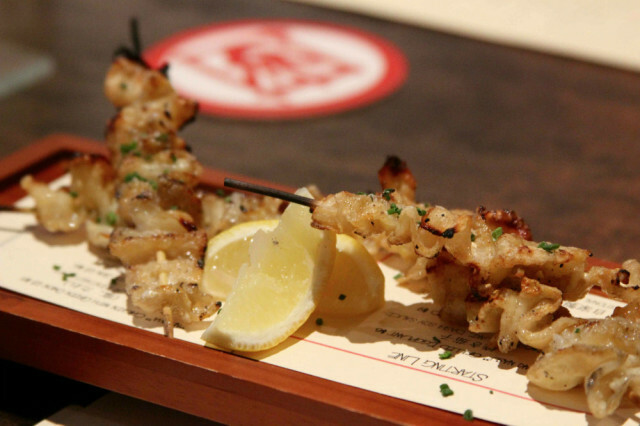 You can order skewers of grilled chicken skin straight off the robata that's crumpled like silk and tastier than any rasher of bacon. But you can also order chicken fried steak (which I'm told is terrific, and which I sadly didn't save room for). This is Houston, after all, and where Izakaya succeeds is by allowing its partner chefs Manabu Horiuchi and Jean-Philippe Gaston wide berth in exploring all of the particular influences that flow into the city. This especially makes sense if you consider the background of the chefs themselves: Horiuchi first moved to Houston in 1999 to serve as the executive chef at the Consulate General of Japan, and liked it so much he stayed, eventually opening Kata Robata to great critical acclaim in 2010. 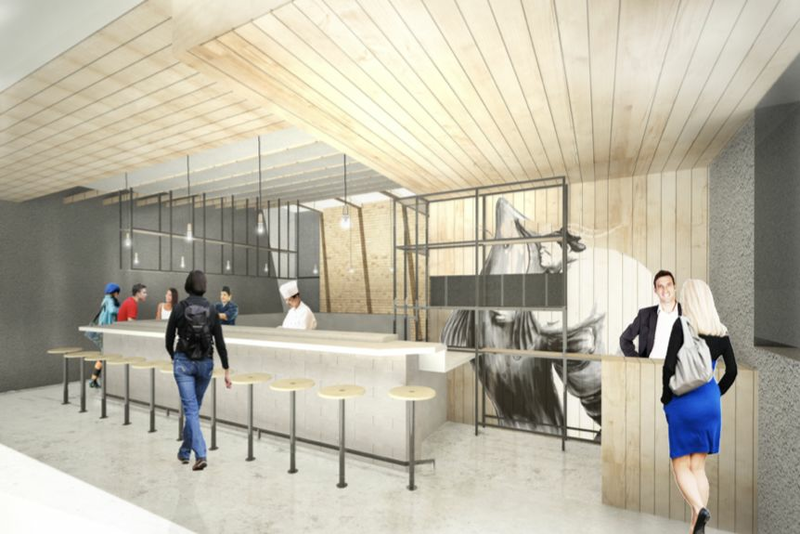 Mexican-born, French-raised Gaston worked under Horiuchi at Kata Robata before opening his own critically-acclaimed spot, Cove, a raw bar, two years later. 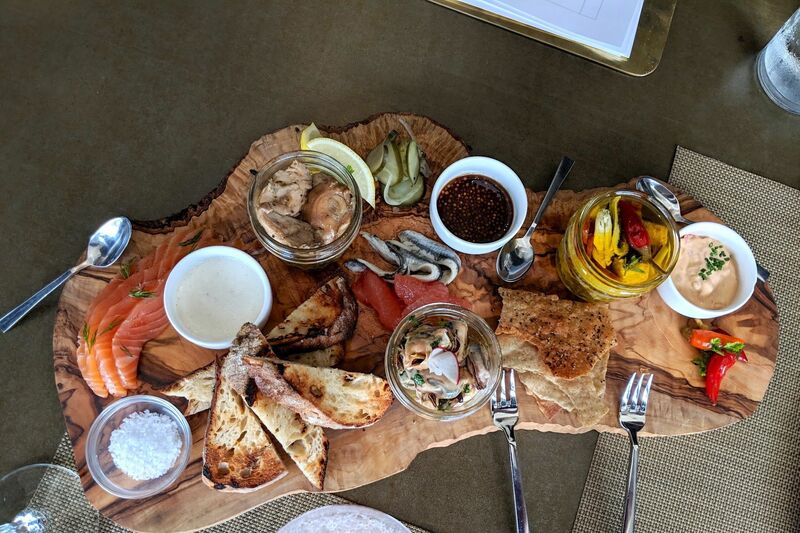 Cove didn't work out, but its DNA is encoded into the menu at Izakaya in its striking ceviches and crudos, while Horiuchi's mark is seen in bowls of gentle chazuke with snapper and grilled Portuguese octopus in a summery yuzu vinaigrette. The interior dining room at Izakaya leads onto a lush patio that's lit up at night. Even with a table of five, however, we were only able to work our way through a meager quarter of the menu, managing to gamely finish off a bowl of hot, crispy izakaya fries dipped in the sort of tangy-sweet Japanese curry that always reminds me of Bisto Chip Shop curry (in the best possible way) and, yes, one dessert. It wasn't from Fluff Bake Bar, but it could have been: named after Elvis, blending together bananas and peanut butter and jam and soft, buttery pound cake and a final strip of candied bacon across the top. It would've made the King proud; he was always big in Japan.